In 1978, McDonnell Douglas and British Aerospace developed the T-45A Goshawk, a carrier-suitable version of the British Aerospace Hawk. The first Hawk, which flew Aug. 21, 1974, was established as the Royal Air Force principal jet trainer and served the U.S. and European air forces. The Navy awarded the T45 Training Systems contract to the McDonnell Douglas and British Aerospace team in November 1981, with McDonnell as the prime contractor. 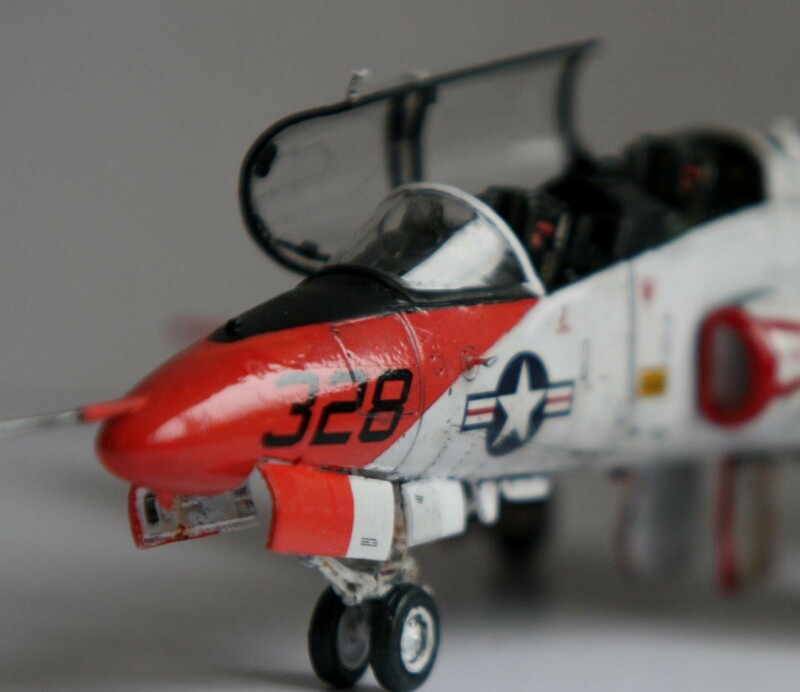 McDonnell and British Aerospace collaborated on significant modifications to make the basic Hawk design aircraft carrier suitable as the T-45A, a two-seat, single-engine jet trainer that is approximately 39 feet (12 meters) long, 14 feet (4 meters) high with a wingspan of 30 feet, 10 inches (9.4 meters). 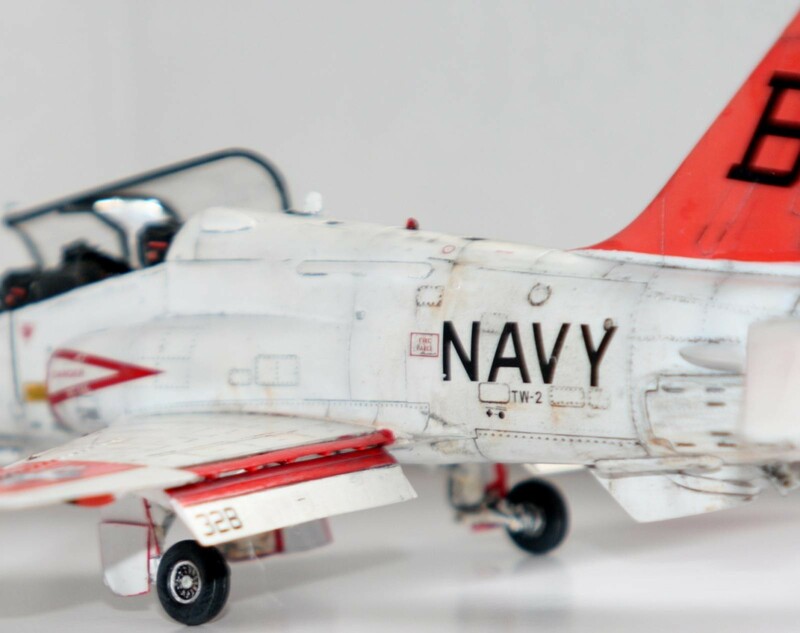 The U.S. Navy ordered more than 125 T-45A Goshawks, intending to use them to replace the TA-4J Skyhawk in the Advanced Jet Training program and the T-2 Buckeye in the Intermediate Jet Pilot Training program. 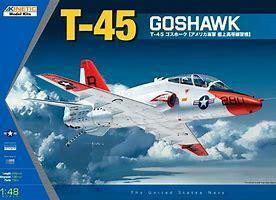 The Navy chose “Goshawk” as the name for the T-45A in 1985. The name originally was assigned to the Curtiss F11C, a U.S. Navy fighter aircraft in 1932. The aft fuselage and wings of the Goshawk were built by British Aerospace in the United Kingdom; McDonnell Douglas assembled the forward fuselage at its Long Beach, Calif., plant and performed final assembly and production testing in Palmdale, Calif. Final assembly of the first production model of the Goshawk began in December 1988 in Air Force Plant 42 at Palmdale. 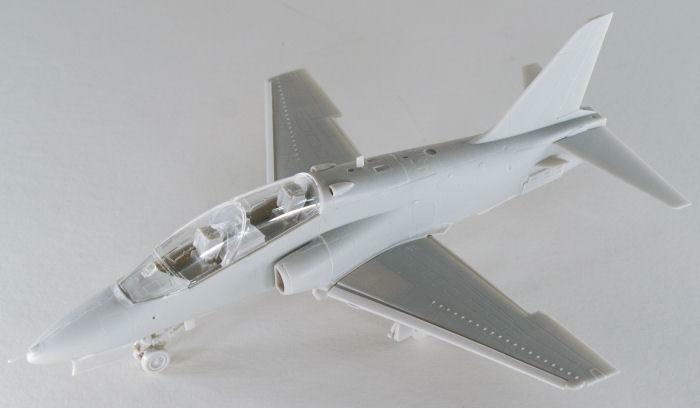 In 1989, McDonnell Douglas moved production of the T-45 program to its St. Louis, Mo., facility. 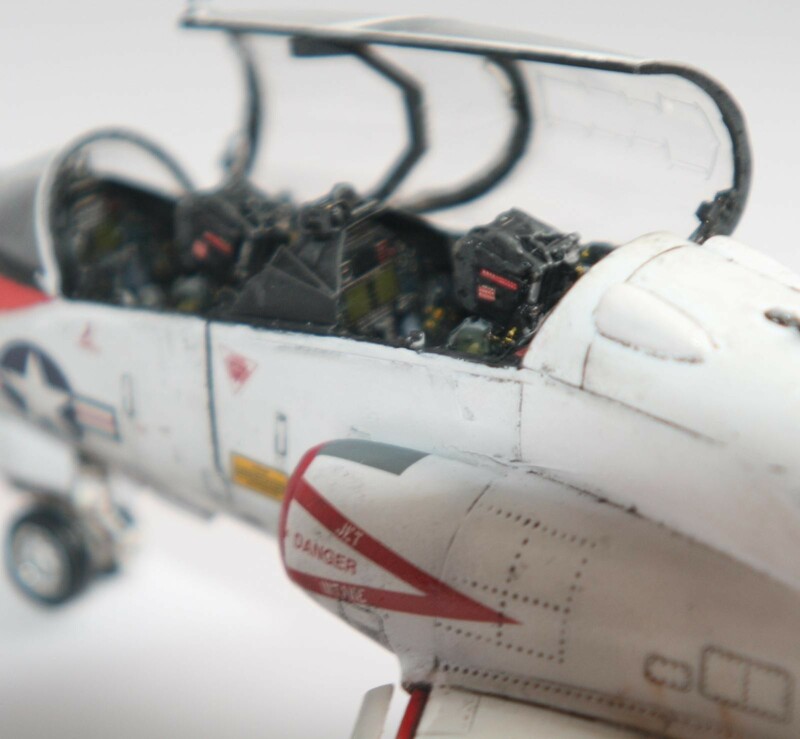 The T-45C, with a digital cockpit to train pilots destined for the F/A-18 Hornet, the AV-8B Harrier II and other carrier-based aircraft, made its first flight in October 1997. It had two multifunction displays in each cockpit; the displays provided navigation, weapon delivery, aircraft performance and communication data. Boeing delivered the 221st and final T-45 training jet to the Navy in November 2009. 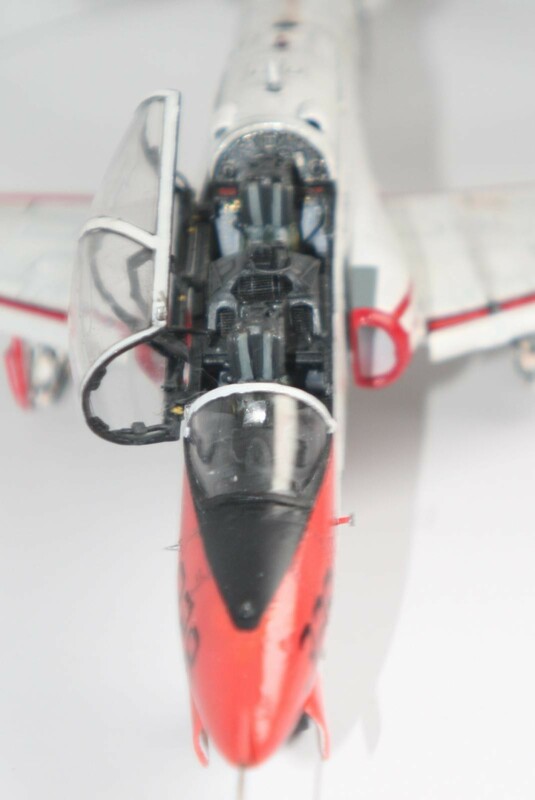 The company continued to support the T-45 fleet by providing engineering, logistics and support equipment in partnership with BAE Systems, the successor company to British Aerospace, which had supplied the aircraft’s rear and center fuselage sections, wing assembly and vertical tail. On Aug. 26, 2010, Boeing joined the U.S. Navy at Cecil Field in Jacksonville, Fla., to celebrate the Naval Air Training Command’s one millionth flight-hour with the T-45 Goshawk. 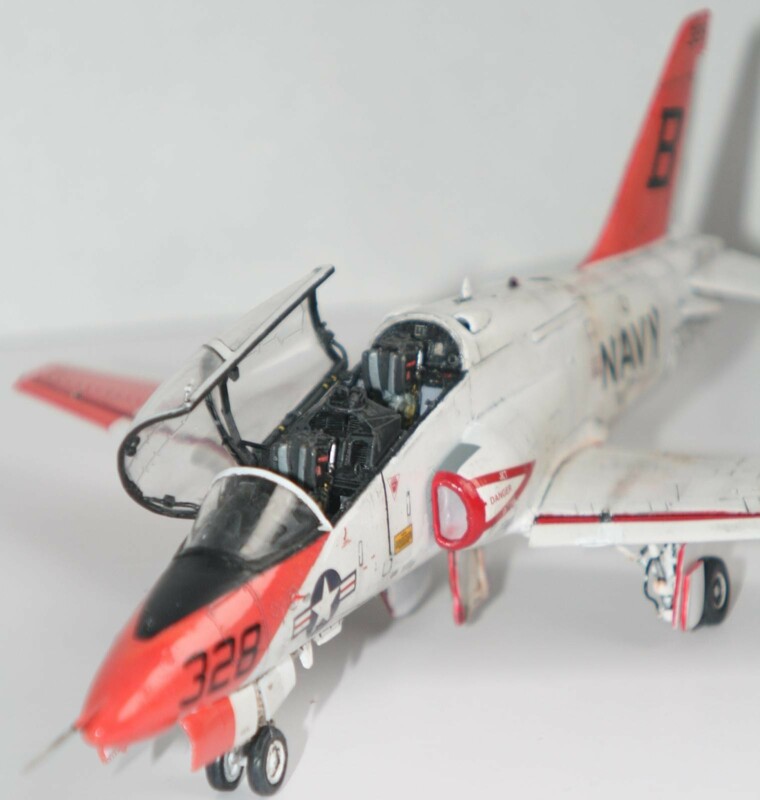 The Goshawk had become a component of the fully integrated T-45 training system, which also included high-fidelity instrument and flight simulators, computer-assisted classroom learning, an automated training-management asset and contractor logistics support. 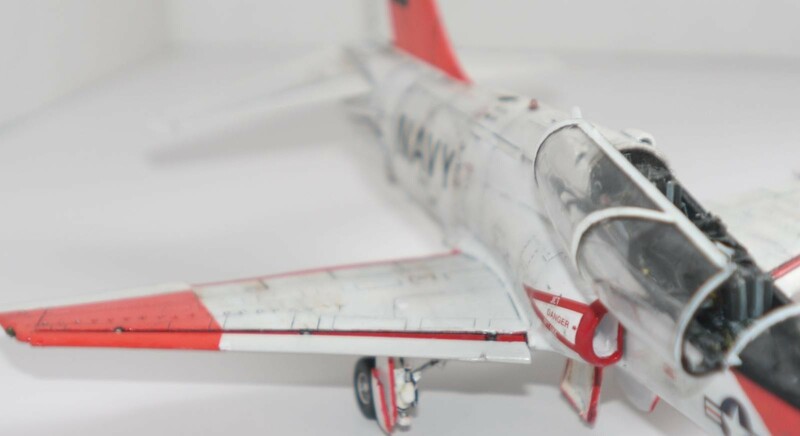 While Italeri produced the first T-45 kit in plastic in any scale (in this case 1/72), Kinetic Models has answered with the very first kit of this aircraft in 1/48 scale plastic. Molded in light gray styrene, this kit is rendered on four parts trees plus a small tree of clear parts. The surface detailing is scribed and nicely done. I built this model some time ago. 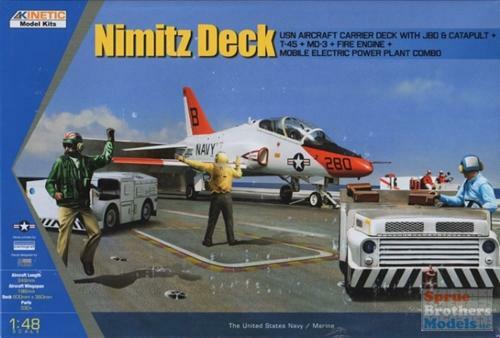 I was really attracted to the fact that my purchased version included not only the 1/48 T-45, but, the carrier catapult section of the deck, blast deflector, deck vehicles, and several crew figures. Unfortunately I do not have pictures of these other items with this plane on it. 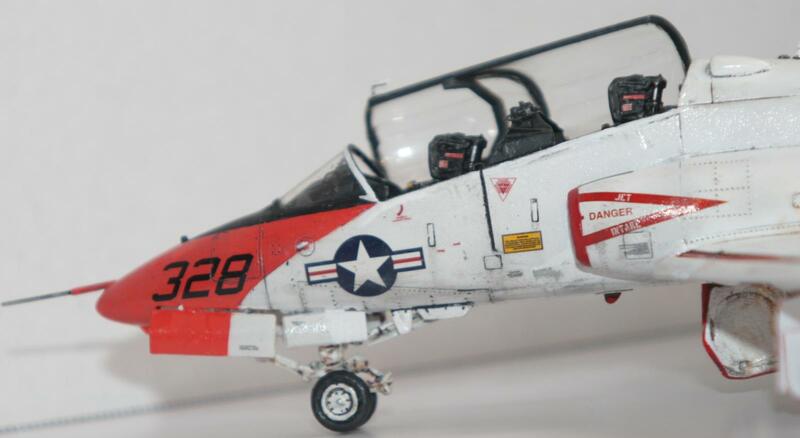 If you look for my 1/48 T-2C Buckeye article on my blog will you see photos of those other items. Overall these items are very impressive and build up really well. The combo kit is worth the extra price IMHO! From what I recall the kit was of decent quality with decent fits, average details, and nice surface details. The average model maker will be satisfied with what is included in the box regarding details but at the time I was not completely satisfied. I like to busy up the cockpits in Naval aircraft especially with the large 2-seat cockpit being opened up. I used some styrene bits and pieces, flexible tubing and wire, and some decal placards to accomplish this objective. I also made some vents in the IP cowling that are visible on the actual aircraft. I filled these vents with spare PE grating. I also wanted to busy up the wheel wells so I also used some spare parts and flexible wiring in these areas. 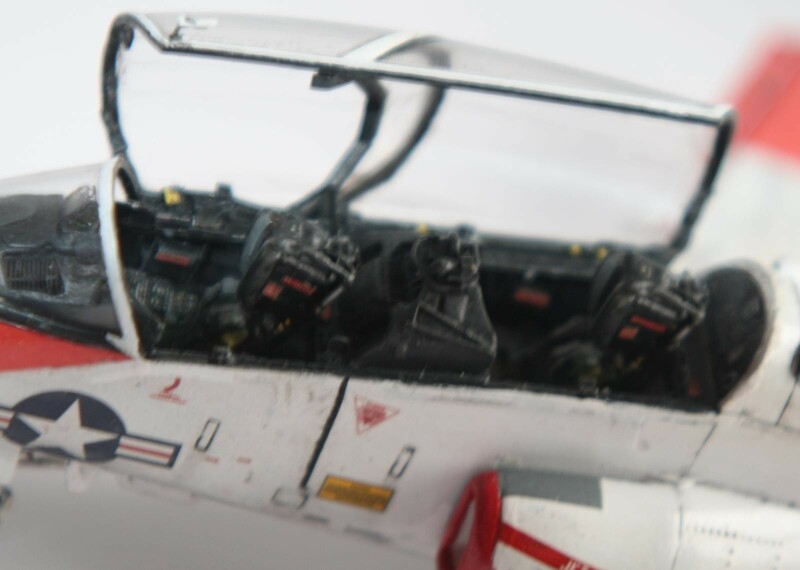 I also had some photo-etch spare seat harnesses for this version of the ejection seats and affixed them to this model. The IP came OOB with some of the nicest raised relief detail and was a breeze to paint being so well defined. Sorry I could not provide better photos of this section of the model. In fact I apologize for the overall poor quality of all the attached photos. If I still owned this model I would of re-taken the pictures for this article but it was sold some time ago. Regarding the wings I was very satisfied that the kit allowed for the flaps being lowered and the slats extended. 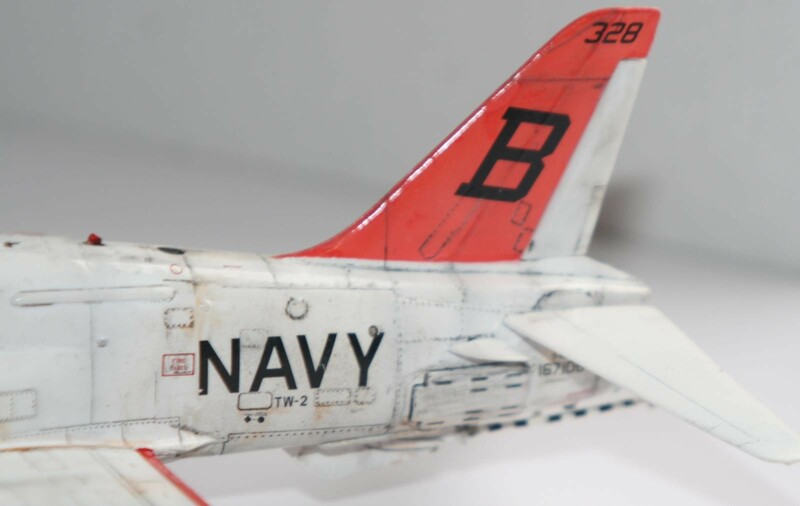 I love the look of a Navy aircraft all “dirtied-up” as in the landing configuration. It just provides for more visual interest and IMHO looks “cool”! The build was straight-forward and easy. The only area that needed significant sanding/putty was the intake covers where it met the side fuselage. Fairly large gaps in this section. I left the canopy open so I cannot comment on the fit of this piece to the fuselage area. 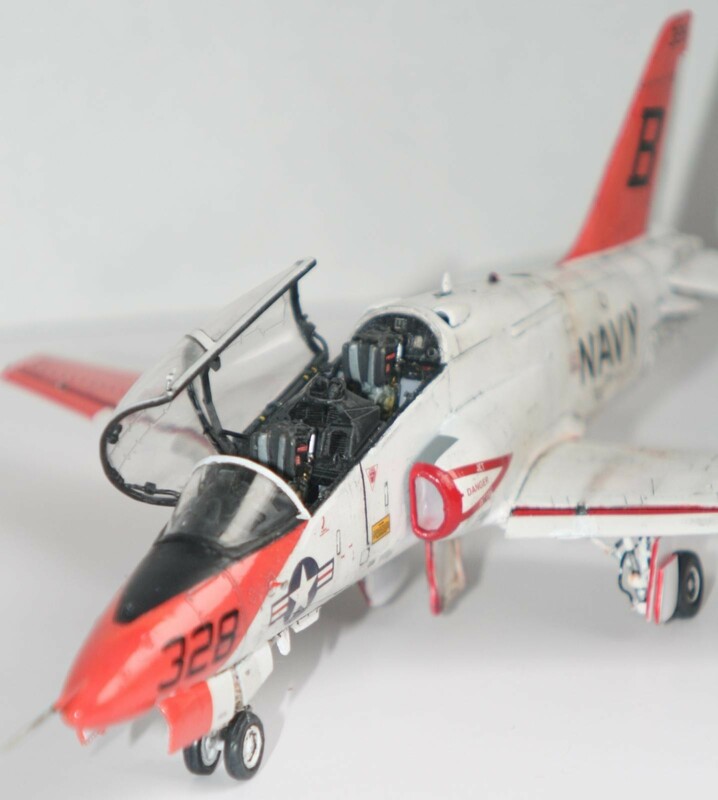 I included photos to show both box covers for the T-45 alone, and the combo-kit. I also included the model assembled with no paint and no extra parts, and/or, modifications. Great job! Nice to see trainers. I do like the paint scheme! Nice work! Looks fantastic Paul. Your extra detail & weathered paint job was well worthwhile. 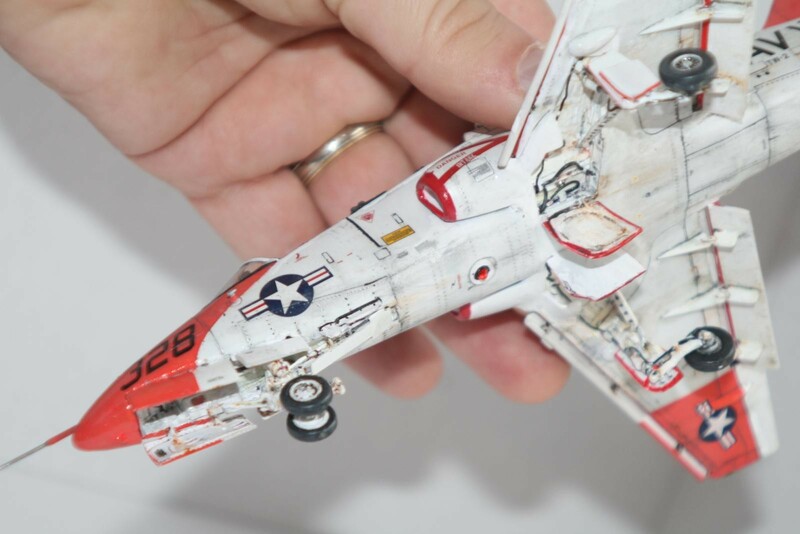 Paul, Very attractive paint scheme, and a very realistic look , Well done !